A compatibility patch for Anna's Winterhold Restored by Anduniel and No snow under the Roof v2.3 by Prometheus for Skyrim Legendary Edition. - Again thank you very much each and every one for your permissions. - You are not allowed upload your location patch on other sites (you have to ask explicitly if you want to upload any translation patch anywhere else), please don’t forget to credit all respective authors! 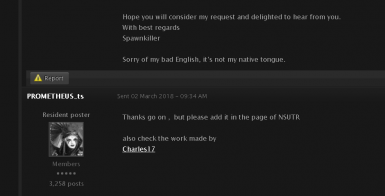 - Otherwise you are not allowed to change or manipulate any of my mods in any way. - This is a Nexusmods.com exclusive release. I don’t grant any permission to upload my creations anywhere else. - You are not allowed to use any of my content in your mods (they are Anduniel's or Prometheus asset’s anyway). - You are not allowed to use any content of Anna's Winterhold Restoration LE nor form No snow under the Roof mod! - Always ask the respective mod author's first if you want use any of their work! Skyrim Special Edition Version can be found here. 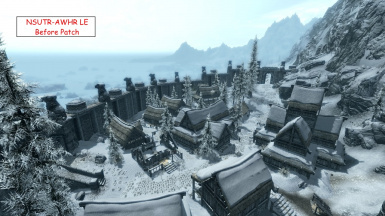 This is a compatibility patch for Anna's Winterhold Restored by Andunie and No snow under the Roof v2.3 by Prometheus for Skyrim Legendary Edition. Please also make sure you only report problems of the compatibly patch itself and all the other bugs on their respective mod pages (AWHR, NSUTR). so be careful and make BACKUPS of your save game!!! Does it need a new game? If Anduniel decides to, she can provide more snow edits herself in later updates of her Anna's Winterhold Restored mod (in theory without the need of updating this compatibility patch). ﻿please endorse their work, and consider donation support, thank you!